This exercise will add the support of the midline to the rotation of the thoracic spine in the oblique abdominal curl. To do this exercise you will need a mat and a magic circle. Start by lying on your back with your knees bent, feet planted on the ground and the magic circle between your thighs just above the knee. Inhale into the back of the ribcage and exhale as you squeeze the magic circle. 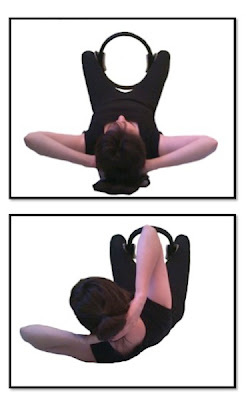 Continue exhaling as you lift the right elbow and shoulder girdle and reach it toward the lift hip, thigh, and knee. Inhale to return to the beginning and then repeat on the other side. 8-10 times alternating sides. If you have a diagnosis of osteoporosis you should not do this exercise. 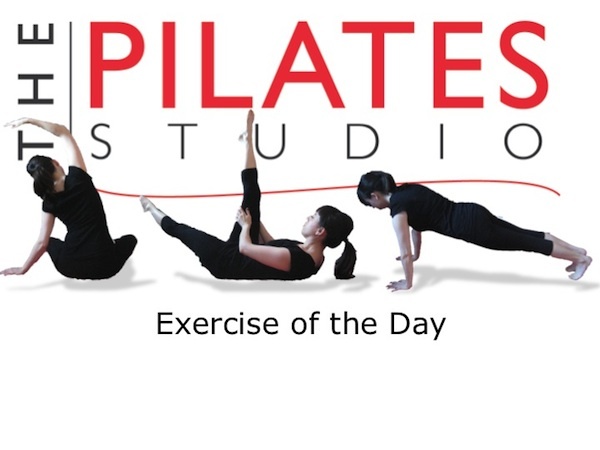 Often in oblique abdominal exercises the pelvis tends to roll from side to side. In this exercise you want to be sure that both sides of the pelvis are even and the pelvis should be still as the upper body moves. Be aware that you are moving the entire upper quadrant evenly. Often people reach just the elbows to the opposite knee, when in fact the entire shoulder and even ribcage should lift.